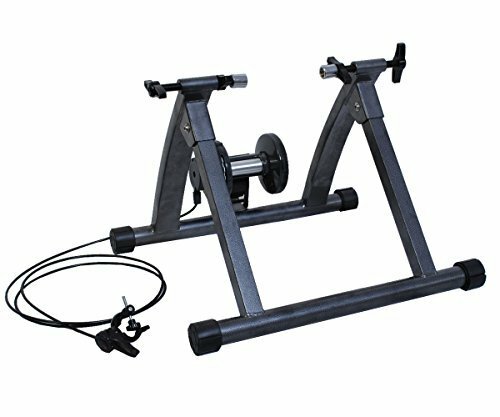 This bicycle trainer is specially designed for indoor workout and training. It just takes a minute to set it up, clamp your rear axle with the quick clamp and adjust the contact between the wheel and the polished roller. With its fluid drive resistance system and fluid cooling flywheel you can do whatever you want to do. There is no reason why you can not exercise with your bike when the outside weather is bad. It is a great product for the Beginner or Professional who wants to stay in shape all year long. If you are into this sport, you will not want to be without one. The trainer includes a drive-by-wire device so that you can change the resistance from your handle bars directly. Quiet operation Folding design, easy to carry and storage Fixed device, easy to install and remove Fits 26-28 inches or 700C bike wheels with quick release Wholesales is available, pls contact us by e-mail The trainer includes a drive-by-wire device so that you can change the resistance from your handle bars directly. If you have any questions about this product by FDS, contact us by completing and submitting the form below. If you are looking for a specif part number, please include it with your message.